Last week, in the midst of what seemed like a fairly large crackdown on cyclists, friend and fellow StreetsPAC board member Sebastian Delmont tweeted a picture of police officers ticketing people for riding on the sidewalk on Clarkson Street, just off of West Street. Clarkson Street is a major exit off of the West Side Greenway for cyclists heading to points east. It’s also a place where one will find a lot of cyclists riding on the sidewalk, for reasons I’ll outline below. The question I have is this: is conducting a ticket sting at this location an effective use of limited NYPD resources? As is evident in the picture above, there are no businesses that face the street. Pedestrian traffic is very light to the point of not even existing at some hours. Does ticketing cyclists in this location do anything to enhance public safety? Now, I know some people may read this and think that I’m making excuses. After all, the law’s the law. Ride on the sidewalk and get caught? Tough, right? Plus, some people may believe that by focusing efforts on places where it’s easy to catch cyclists, the NYPD can influence behavior and encourage cyclists to observe the law in locations where pedestrian safety is a genuine concern, such as the crowded sidewalks of Soho or Midtown. Ticket a person for riding on the sidewalk here, and he’ll think twice before doing it anywhere. But that line of reasoning relies on a tabloid-fueled idea that cyclists are either willfully flouting the law simply because it’s easy to do on a bicycle or because they’re ignorant of how the law applies to them. Indeed, one of the explanations I’ve heard for this recent crackdown is that with all the new cyclists out there thanks to Citi Bike, it’s important to make sure everyone is aware of and follows the rules of the road. So what is it about the design of this street that encourages cyclists to violate the letter of the law, knowingly or not? Let’s start on the greenway. If bikes are “vehicles,” why is there no through access to the roadway for them? Normally there’s a painted sharrow pointing cyclists to the street, but due to the high auto volumes on West Street it rarely survives for long after being repainted. 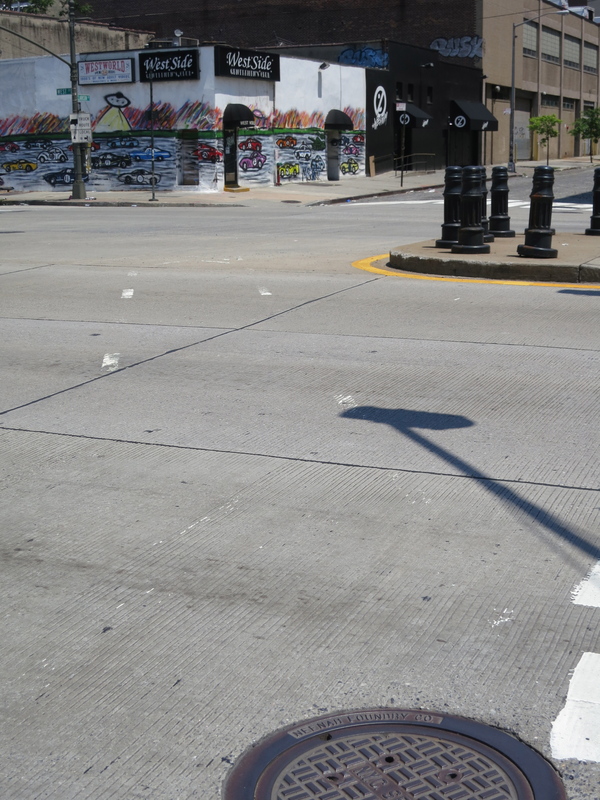 Even when visible, the sharrows direct cyclists into the middle of an intersection where drivers have a left turn signal when the north/south car traffic is stopped. It’s no surprise that cyclists would rather mix with a few pedestrians than head straight into a shared space with turning trucks and cars. Faded paint does not a bike lane make. Even wide Citi Bike tires are no match for this street. The timing was mere coincidence, but most cyclists take the sign’s message to heart. The lure of the open sidewalk. I would argue that cyclists who ride on the sidewalk on this stretch of Clarkson Street are making an entirely rational decision, choosing the safe and smooth over the dangerous and rough. Even in the unlikely event of a pedestrian using the sidewalk here, sharing space with people on foot is far less dangerous here than it is on certain stretches of the greenway. The cyclist in the two pictures below may have been taking her first ride from the greenway to Clarkson. After riding in the crosswalk, she actually merges left with the apparent intention of taking the road, but less than half a block later realizes there a safer and smoother option. Smooth sailing and an inviting symbol. Now he’s on the sidewalk, now he’s not. So what does this prove? That cyclists are renegade scofflaws with little to no regard for the laws of a polite society? That the strong arm of the law needs to punish rule breakers with $50 tickets or criminal summons? That ticketing cyclists will get them to think twice about ever breaking the law again? No, no, and no. 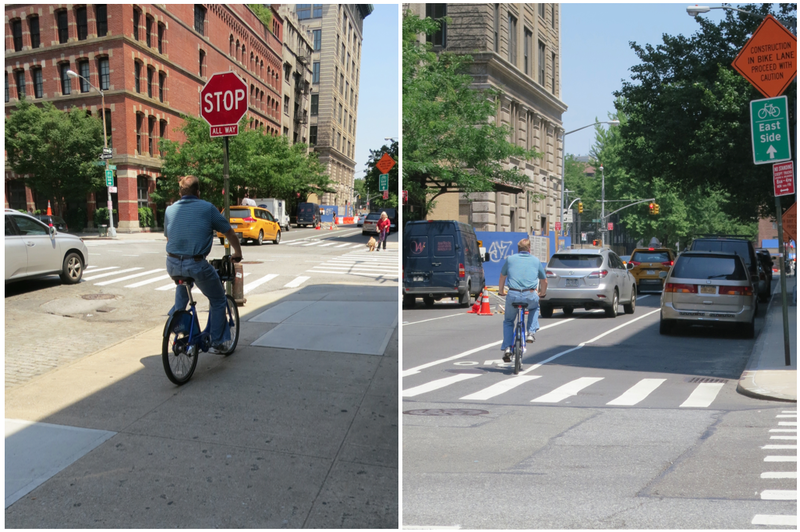 In the absence of police officers punishing them for not doing the right thing, the cyclists in these pictures show that compliance with the law is rarely more than one usable bike lane away. In fact, by waiting for cyclists to ride on the sidewalk on this particular block and not just two blocks east, the NYPD is demonstrating a rather intuitive understanding of the concept that better infrastructure breeds better behavior. Despite what the tabloids may tell their readers, most cyclists are rational actors. It’s the design of our streets and the priorities of our police department that are totally irrational. Any tickets for this behavior? Sadly this sort of policy seems to be SOP at NYPD. This is just more evidence for what New Yorkers have long known: the real goal of ticketing is revenue, not public safety. Thanks for pointing this out for those who do not already know. Great work and excellent pictures. FWIW, I prefer Christopher, R on Washington, L on Morton or Spring for leaving the Greenway toward points east. The pavement is better. The car parked on the sidewalk has government plates, and therefore is Above The Law ™. Your points are so logical it wants to make me cry. Bravo! The law is the law is not a tabloid idea, viewing any crime as more acceptable than another is a slippery slope. I agree with you in the particular case of this street, but you’re quick to turn to car hate. Most bike activists are, and that doesn’t help your cause. Motorists are allies not enemies. Your safety is of their concern (if I hit you, I go to jail. I don’t want to hurt anyone and I certainly don’t want to go to jail). As a motorist I can get behind your demand of smarter exists of the West Side Greenway, a smarter system would mean better, faster, and safer transit for all. And since they took lane space for bikes, I don’t think it’s crazy to ask for bike lanes on certain sidewalks. Focus should be in improving whats being build. That they should ticket more motorists (true!) it’s besides the point. You think drivers don’t get mad at other driver assholes? To me this is a case not of bikes vs. cars, it’s of assholes vs. conscious citizens in the street and conscious citizens vs. bureaucrats in the halls. And we all can see the hypocrisy of it all when the rich can move CityBike stations from their buildings while others with legitimate concerns are being ignored by the city. The law may be the law, but we have a system of human officers and judges to exercise discretion when that law runs afoul of basic principles such as public safety. Doug is pointing out a case where the human actors we entrust to use that judgment are instead abusing it. Many cities, including some in the US, have bike lanes running in sidewalks, so I’m sure you won’t get any opposition from bike activists for extending that concept to under-used sidewalks in NYC. So let’s not get down to the level of those who decide when and how to implement the law. And I am agreeing with you on the sidewalk bike lanes. I think that was clear. Where in this post did you read anything that suggests “car hate” or “bikes vs. cars”? With the exception of the final picture–which is meant merely to provoke discussion about what kind of behavior we accept as mostly harmless–this post says nothing about the relative merits of ticketing motorists versus cyclists. 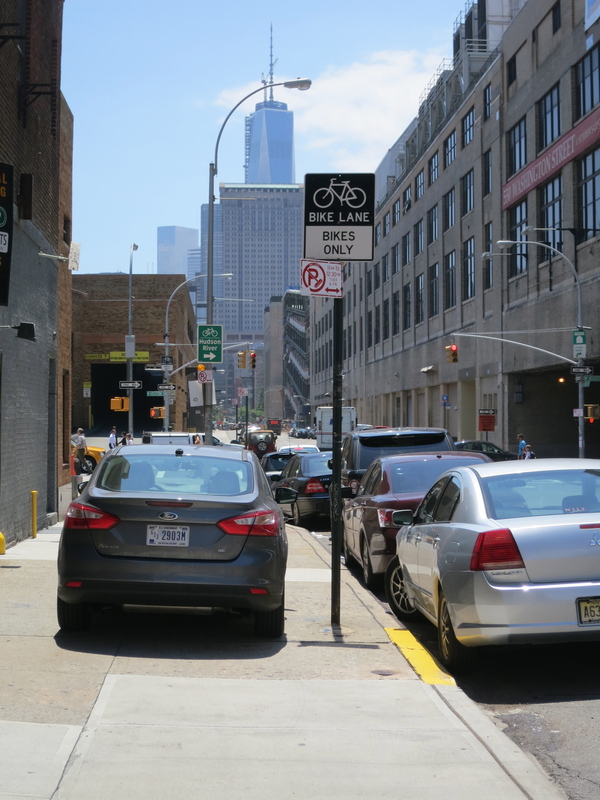 This post is specifically about targeted enforcement against reckless *cyclists* in places where it will enhance public safety and change behavior. A ticket sting on Clarkson does neither of those things, since the cyclists are not being reckless at all. Rather they are making a decision that is forced on them by the signage and the design of the street. We’ve engaged online before. You seem to have made up your mind that I am anti-car and it appears to affect what you read into this post. I am not anti-car at all. I am pro-common sense. But you did have to throw that last pic in didn’t you? So posting a picture of a car parked illegally on the sidewalk makes me a car hater? 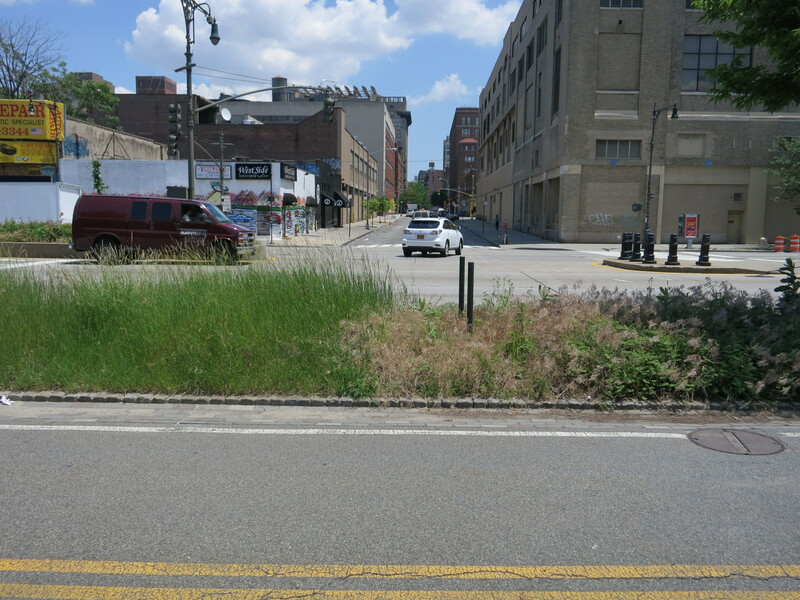 The point is that I would no more want the NYPD focused on ticketing cars parked on the sidewalk here if it meant taking away from resources that could be used to improve behavior and enhance safety in areas where it would make a difference. As much as it may be annoying to walk around that car if one is a pedestrian, I don’t believe it’s a great use of NYPD efforts to keep sending someone over to make sure it’s parked properly. It sends a message that ticketing is less about public safety and more about easy revenue. I’m using the exact same logic to explain why ticketing cyclists here makes zero sense. Sorry, I believe in ticketing that driver as well. But I agree with you on everything else, so again, the focus is on improving whats being build (bike friendly NY). Anyone who launches a lethal poison attack upon myself and my children is my enemy, not my ally. So basically the city needs to pave over Clarkson St. Problem solved! thoroughly understand your logic, but still disagree. if cyclists dont want discomfort of this road, go to a different road, or walk the cycle on the sidewalk. while I agree police resources might be better spent and these sidewalks are desolate, that doesn’t excuse riding on the sidewalk, ever. while it is more convenient to go the way most cyclists do here, so could be said of cars that illegally uturn to get parking spaces or fail to yield. We as cyclists have enough unfounded misinformed hate coming our way, defending illegal behavior is not a way to counter it. Boo hoo the road is bumpy. life isn’t perfect. It would also be great to run red lights, to sideswipe pedestrians in the bike lanes and so forth. just because it is easy doesn’t mean we should do it. There is short path between the roadway in Central Park and Columbus Circle with clearly marked signs saying no cycling. As I walk my cycle on this path, I will yell at those who don’t they are giving all of us a bad name. That’s what I feel about this post. 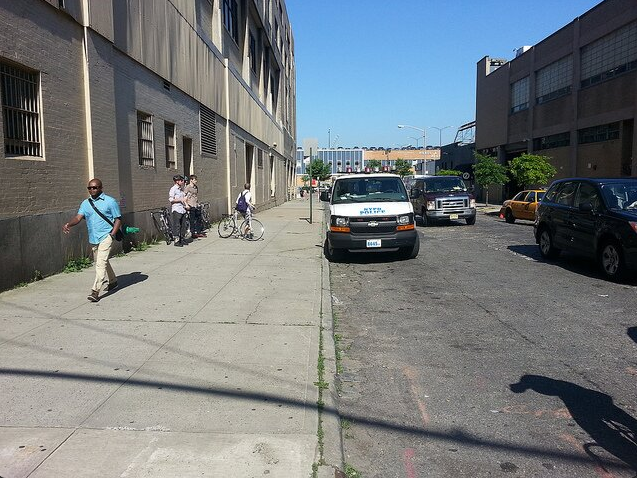 We should work with DOT to improve this road, not encourage lawbreaking. 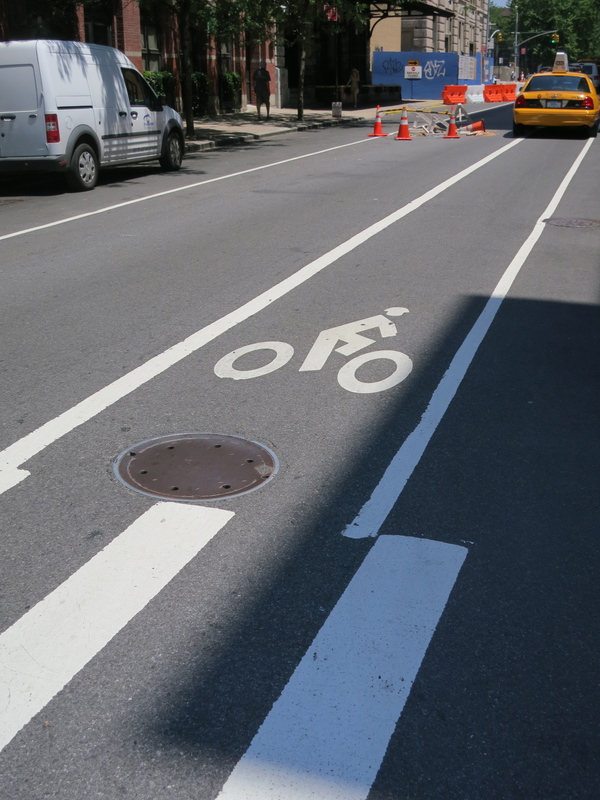 But that ignores places where cyclists are told specifically to ride on the sidewalk, such as a stretch of Kent Avenue, underneath the Brooklyn side of the Manhattan Bridge, across Sara Roosevelt Park at Rivington Street, and across just about every end of every block on the Allen Street bike lane. I’m sure I’m missing at least a few others. I think most people who take this left here see the directional sign and the design of the street that positions them with pedestrians and then assume that the city has in fact *designed* this route to take them up on the sidewalk until it meets up again with the bike lane at Greenwich. I just don’t believe it’s as simple as either/or choices. And I certainly don’t believe that it’s great to run red lights or sideswipe pedestrians. Who on earth believes that? 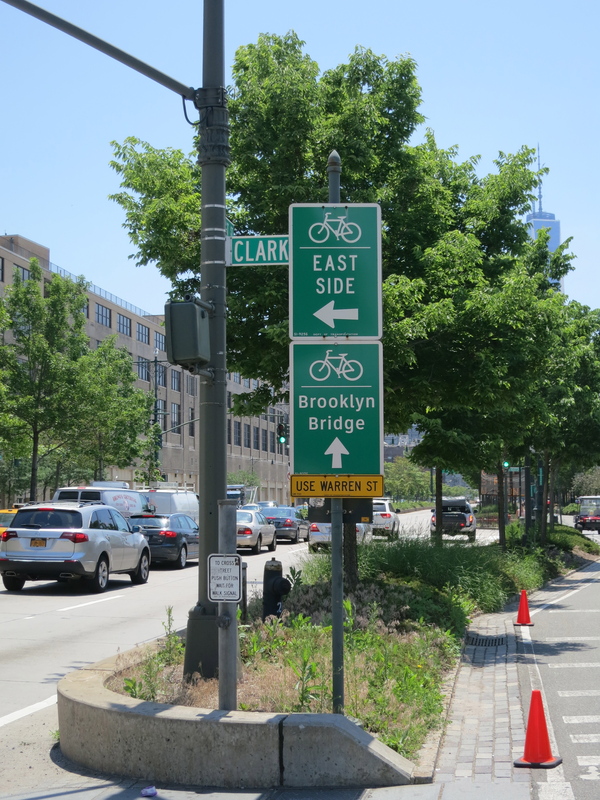 Two things can be true at once: that the NYPD shouldn’t waste its time here AND that we should work with DOT to improve this route for cyclists. Sorry, couldn’t resist. I’m in agreement with Doug’s comment and the overall gist of the posting. Lets spend police resources where they’ll make a difference in OUR safety. Let’s recognize that people will make rational decisions about how to get from here to there regardless of transportation mode. Tickets for riding on the sidewalk fall under the jurisdiction of the Environmental Control Board (ECB). If you are given a ticket or summons that requires you to appear in criminal court instead, you might be able to get the ticket thrown out for lack of jurisdiction. Also, take a look at the New York City Traffic Rules. Another approach might be to make the case that cycling on the sidewalk was reasonably necessary to avoid conditions that would have made it unsafe to continue within a designated bicycle path or lane. Thanks so much for the detailed rationale for an “illegal” maneuver I make all the time and will continue to make even if the NYPD has nothing better to do with its money and time. Given that this is a key west-east route from the Greenway, why doesn’t DOT narrow the sidewalk and add a protected bike lane for two blocks (or more)? Or do it on the cheap by simply painting a lane on the sidewalk, which is wider than most side-street sidewalks and has very little ped traffic? . Interesting post. 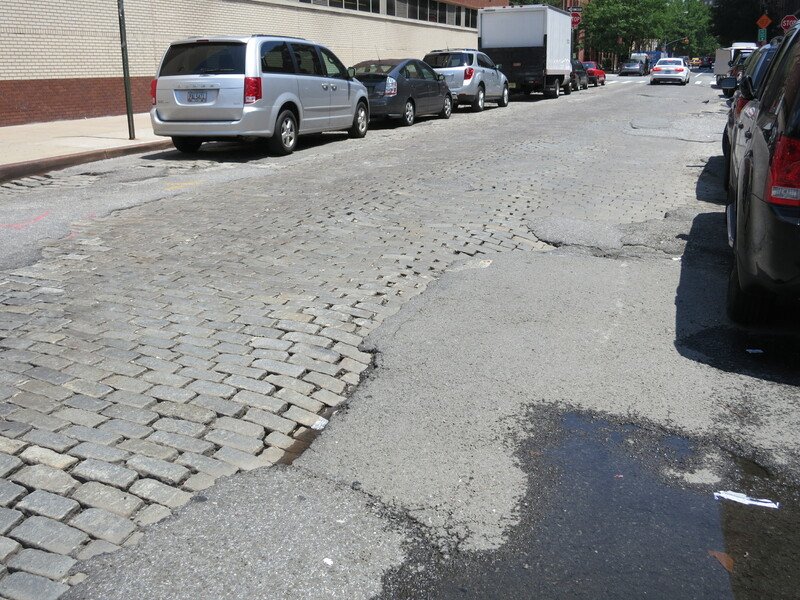 What should be done about all the cobblestone streets for cyclists? I absolutely love the charm of NY cobblestone streets. I absolutely loathe riding on them. I work and ride to SoHo everyday. Avoiding the cobblestone is possible, but I don’t normally choose to do it. I ride slow, and bike my lines carefully. 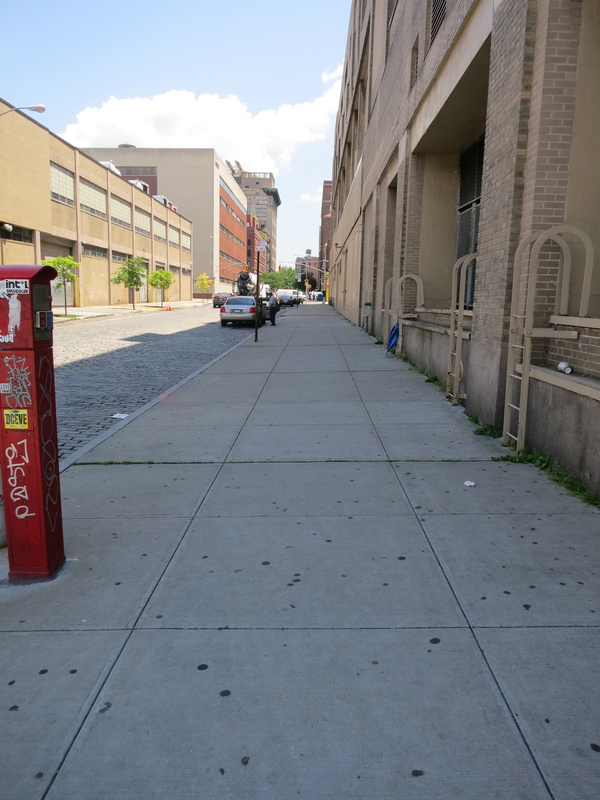 On Clarkson street, It would be nice to see part of that sidewalk designated for cyclists, but this isn’t really a scalable option for all cobblestone-lined streets in New York. 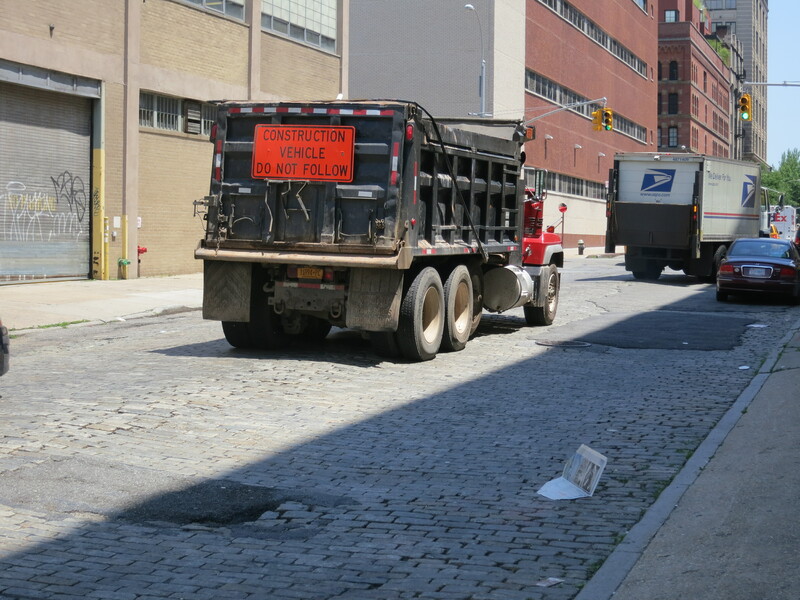 I see cyclists on the sidewalk near my office all the time because of the cobblestone. I don’t condone the behavior, but I can understand the reason. Unfortunately, the sidewalks are narrow and fairly crowded in this area. Bikes don’t belong there, and there isn’t enough room to create a bike lane on the sidewalk. Not to mention the fact that the sidewalks are in rough shape too, and pedestrians walk around like kids in Disney Land. 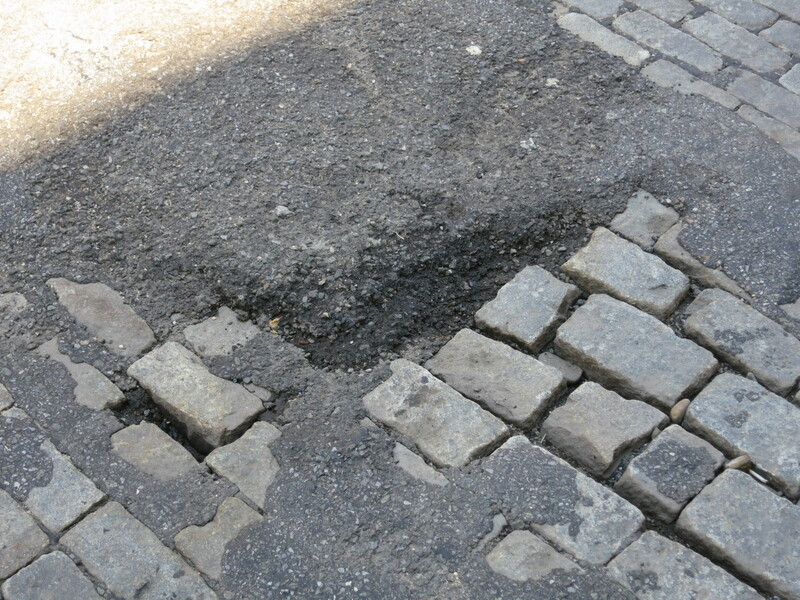 I think rough roadways and cobblestones are just things we have to deal with as cyclists in NYC. I, for one, am not ready to see all that beautiful cobblestone paved over. Thanks for your comment. I wouldn’t want to see all of NYC’s cobblestones replaced either, but in places where there’s a high amount of bike traffic or the desire to get cyclists off the sidewalk, there are solutions. Jonathan Maus has a good round up at Bike Portland.